The Eversafe 40’x50’ steel workshop building special price listed here is $25,853 and has one 10’x10’ steel garage doors, a steel walkdoor with free shipping included. You have the flexibility in the placement of your doors to fit your property and meet your needs. Other workshop building kit sizes are available such as 40’x60’ and 50’x50’ and more. Our commercial building line features all steel heavy duty hot dip galvanized truss frames, secondary framing including girts, purlins and doorframes. The steel roof and wall panels as well as the trim package are finished with a durable baked on polyester silicone enamel paint. Eversafe’s color selection of 12 colors makes it easy for you to match the other buildings on your property. Stamped certified engineer building drawings for your state are included to make it easy for you to pull a permit. Our metal buildings in Florida can be designed to meet hurricane wind loads and the heavy snow loads in the mountains and northern states. Our buildings are built to last a lifetime and designed to remain attractive for decades using the highest quality protective coatings and paint. Eversafe’s hybrid 40’x50’ workshop metal buildings can also be configured in several ways to best fit your application. For example, you can add a low cost shaded area with a roof-only lean-to or carport style building to your enclosed workshop. You can also easily integrate different facades or decorative panels on the exterior walls for a custom architectural finished look. What are your options when it comes to steel workshop buildings? There are literally dozens of different designs, features and functionalities you can choose from. You can have one that’s two stories tall, with a larger garage door and a front office, one that’s designed to store RV’s, options for extra storage or a loft and more. Selection is not something you are limited on. The first and most important thing you have to do is to review your workshop needs to see which options best suit you. Eversafe can custom engineer any of the features you need for your shop and provide stamped engineer drawings to pull the permit. There are three reasons why metal buildings are the best for your property. The first reason is the affordability of steel garage prices. The cost of materials and labor for an Eversafe garage is substantially less overall than the cost of concrete block or wood. This is an important factor if you are working with a tight budget and need to make sure that whatever you select is cost-effective. Another advantage is time. Because these structures arrive prefabricated, ready to assemble, they can be assembled in a fraction of the time. Our fast construction and low labor costs help to keep prices low. However, the real advantage is that you can get the building installed quickly and start using it for yourself or to generate revenue. 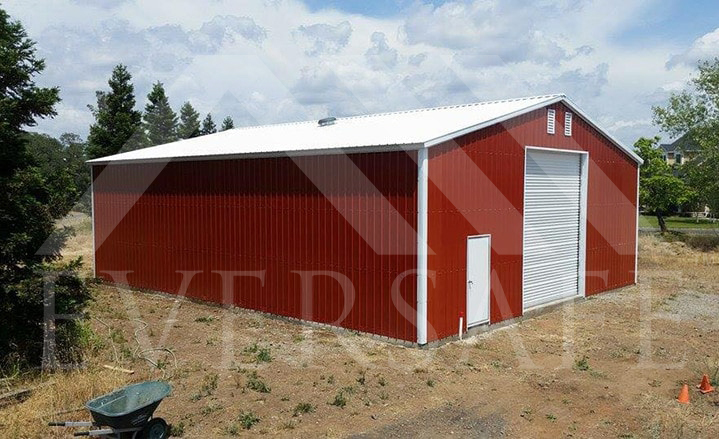 All Eversafe steel workshop buildings are very durable and designed to withstand strong winds, rains, flooding and other issues that may come their way. A metal work shop ensures that you are able to get this structure up faster and that it’s ready to go immediately and you do not have to have the long-term maintenance costs that you would with wood. To learn more about the durability of these buildings and to get a free quote, call and talk to an estimator now or message our team today. *Prices subject to change without notice and the terms and conditions. Local building codes may vary price slightly. Pictures shown are examples only and may vary from model selected. Please call us at 1-800-374-7106 to speak to one of our Building Speialists for more details.